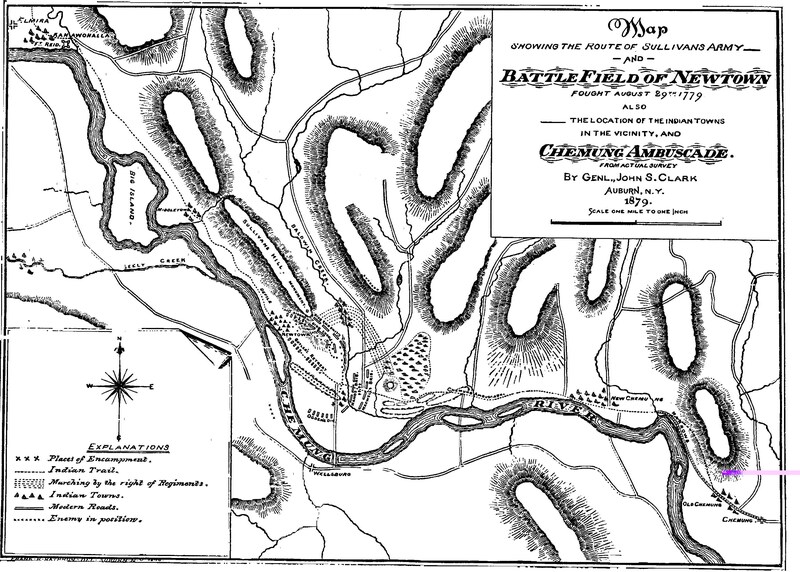 Elvin Birth, The 1779 Western Campaigns, Raleigh: 2003, privately published, "Journals.pdf", p.91. 42.025139 -76.707483 8/14/1779. Elvin Birth, The 1779 Western Campaigns, Raleigh: 2003, privately published, "Journals.pdf", p.111. Misleading because the village destroyed was New Chemung, three miles farther up the Tioga River. "The Sullivan Expedition of 1779, Battle of Chemung, August 13, 1779"
Binghamton University PAF awarded Grant for Chemung Battlefield Inventory Project. No date given. Chemung was the first of only two major battles associated with the Clinton-Sullivan Campaign of the Revolutionary War. The Campaign consisted of a scorched earth attack on the Iroquois, who abandoned their villages prior to attacks. Battle of Chemung yielded six dead and 12 wounded Continental troops, and served as the prelude to the Battle of Newtown. Aug 1779 listing. 8/13/1779 Chemung. Shown as American victory. Aug 1779 listing. 8/29/1779 Newtown (Elmira). Shown as American victory.